Our Toyota Genuine accessories and Thule accessories are available to specially fit your 2019 Toyota RAV4. Please click the button below if you have any questions about a certain accessory, our parts advisors are here to answer all your questions and help select your new accessions. Did you know that you can include accessories into your monthly payment when buying a new RAV4? Ask your Product Advisor for more details! 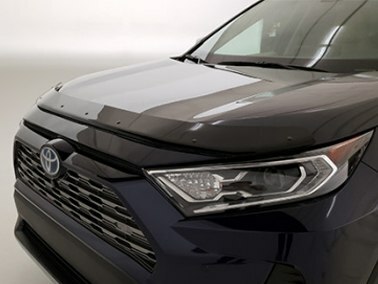 A hood deflector offers your RAV4 high impact resistance and reduces the potential damage to your hood from road debris. Made from a thick high-grade tinted acrylic, it will protect your brand new RAV. 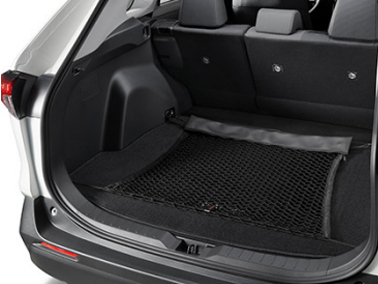 The cargo liner features an innovative split design that protects your cargo area as well as the back of the rear seats. The anti-slip surface features a raised perimeter lip to help keep spills contained. 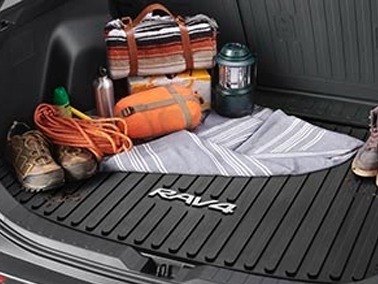 The RAV4 cargo net features a braided netting with elastic closure that is secured by tie-down rings in the back to keep everything from shifting around. Using sensors built into the mirror, this auto-dimming rearview mirror will provide progressive dimming. This mirror also comes with a integrated digital compass with eight directional readouts and integrated homelink functionality that allows you to operate a garage door opener. Safely record the open road while keeping your eyes on the road. Never miss a moment in motion; capture it! The RAV4 Genuine Dash Camera allows you to record the surroundings of your vehicle while it is parked. High performance LED fog lights enhance visibility by providing a brighter light with a higher lumen output as well as extra wide coverage angle for increase visibility of surroundings. Adding side window deflectors will minimize wind noise when driving with your windows open, allowing you to breate in the fresh air without worrying about wind, rain or snow. The Thule Chamber bike hitch was designed with integrated anti-sway that prevents the bikes from bumping into each other. Works with class 1 receiver and fits 1.25" and 2" receivers.